As I mentioned in my Deployment Resources for Kids video, when Bob was deploying last year I was shocked at the complete void of resources for kids whose parents were gone–especially when it came to books! I was so happy to see our friends at Cooper and Me are helping to solve this problem! Cooper and Me and the Military is about Cooper’s best doggie friend, Trooper. He’s a former military dog who comes to live with two military brats while their parents are deployed. I thought the perspective of two parents being deployed at once was a very interesting one. The book is fun and was very easy to read aloud. Amber loves it and we’ve been reading it over and over and OVER for bedtime each night! I think we’re both excited to see a military book! 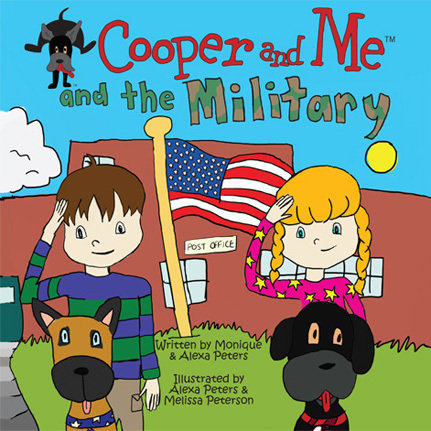 This book is great for military kids or non-military families, as it is written from the non-military child’s point of view. It would be great to use for building empathy and understanding-something I think it really needed! I also loved that there are activities that help children name and process their own feelings about what they’ve read included at the back of the book to help take everything one step further.